Thistle Golf Club & Estates is a combination exclusive golf course and residential community along the Grand Strand in the quiet town of Sunset Beach, North Carolina. The Thistle features three courses - Cameron, Mackay, and Stewart - and boasts an authentic Scottish feel to it thanks to designer Tim Cate. Cate designed the club based on the Links of Leith, located in Edinburgh, Scotland and traditionally known as the birthplace of golf. From first glance, the Thistle appears to be a formidable course. However, this course is actually more golfer friendly than it appears. Cate relied on visual deception to make this course appear more cunning and deceptive than it really is. Despite the fact that the course is actually easy going enough for beginners to enjoy, it does entice players of all skill levels to bring forth their best game. 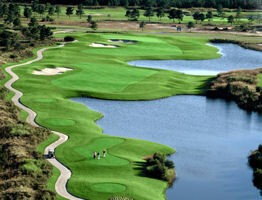 The Thistle presents 27 stunning holes, some of the best golfers have seen along the Grand Strand. The Thistle goes above and beyond, straying away from traditionally used 8-minute tee times to offer 12-minute tee times for a longer, more enjoyable play experience. Combined with the fact that the course is in impeccable shape, it is no wonder golfers travel from all across the country to enjoy this magnificent gem. Players are able to enjoy the game in every traditional sense and thanks to additional tee times, a leisurely pace promotes the most relaxing game in the Myrtle Beach area. This course is a must play for those that truly love the game of golf. Beautiful setting, but food was lacking and service didn’t exist. I realize it was an Easter buffet, but it seemed to be terribly understaffed. Had to go to the bar to get mimosas etc. Food in the line ran out and what was there, was cold. I would suspect the problem was management and HR. The staff was working in a frenzy. Not worth it, neither money nor frustration. Great course...likely the best in the orth myrtle beach area. I played 18 holes here today, 3/11/19 while on my honeymoon. First of all the facilities and course were fantastic, it can be challenging from the tips but if you play smart there are plenty of birdie opportunities. Almost everyone I met was very polite and helpful. Now for why I'm giving a one star rating, I checked in and walked back outside to get a cart, the guys at the cart stand were very friendly, I had paid for a bag of driving range balls to warm up before my round and they directed me to park the cart in the parking spaces behind the driving range, my wife drove the cart to the paved parking spaces behind the range and began reading a book, I walked to a spot at the range and began hitting balls. Mid way through my backswing an older African American man who was also hitting balls on the range loudly told me I needed to move my cart as I was not allowed to park there. I informed him that I was directed to park there by the staff. He then began shouting at me in front of everyone at the range that he worked there and the staff work for him. I told him I would move the cart when I was done hitting range balls. He shouted at me again and told me to move the cart, I told him I only had 12 range balls left and will move it when I'm done with them. He left for a couple minutes I presume to talk to someone about me. When he came back he didn't say anything to me but was loudly telling the person next to him how rude I was and that you "can't make this stuff up". I have been playing golf for 19 years and have never been so disappointed at the behavior of a staff member as I was today. Unfortunately I don't think I'll be coming back as long as he is working at The Thistle. I played 18 holes here today, 3/11/19 while on my honeymoon. First of all the facilities and course were fantastic, it can be challenging from the tips but if you play smart there are plenty of birdie opportunities. Almost everyone I met was very polite and helpful. Now for why I'm giving a one star rating, I checked in and walked back outside to get a cart, the guys at the cart stand were very friendly, I had paid for a bag of driving range balls and they directed me to park the cart in the parking spaces behind the driving range, my wife drove the cart to the paved parking spaces behind the range and began reading a book, I walked to a spot at the range and began hitting balls. Mid way through my backswing an older African American man loudly told me I needed to move my cart as I was not allowed to park there. I informed him that I was directed to park there by the staff. He then began shouting at me in front of everyone at the range that he worked there and the staff work for him. I told him I would move the cart when I was done hitting range balls. He shouted at me again and told me to move the cart, I told him I only had 12 range balls left and will move it when I'm done with them. He left for a couple minutes I presume to talk to someone about me. When he came back he didn't say anything to me but was loudly telling the person next to him how rude I was and that you "can't make this stuff up". I have been playing golf for 19 years and have never been so disappointed at the behavior of a staff member as I was today. Unfortunately I don't think I'll be coming back as long as he is working here. Beautiful course with a great layout but very difficult greens. My best friend's daughter got married here. It is an absolutely gorgeous place perfect for a wedding has bridal suite and groom suite available.. a full bar and room in the clubhouse to have a DJ and dance floor. And adjacent room was large enough for the reception . They had a sit-down dinner with several tables and lots of room even had a 4 tiered wedding cake and still had more than enough room. Highly recommend renting this place for any type of wedding anniversary or birthday paety. Great course. Nice people. Wonderful 19th hole. The course with in great shape. Greens were quick. Staff is super friendly. Awesome place to grab a meal. Had a great time and the course was excellent very challenging but fair. The staff was friendly and went out their way to make our experience enjoyable. Beautiful place, but not a playable course for the average golfer. Literally the hardest pin placement on every hole. I'm sure very good golfers love it, but us regular guys struggle here. It is in great shape, though, and the buildings are all very nice. This is a top course in the area. The greens had some minor spots on them but nothing that was too bad. The staff was very friendly and courteous. The only reason I did not rate this five stars was because I think there are a handful of 5 star courses in the area and this isn’t quite there. My reason for a 1 star review is based on one simple thing... lack of respect for not disclosing the shape of the greens when booking the tee times. It is obvious that there was chemical damage to the greens. I can't imagine it was weather or winter as out of the 27 holes I counted 10 holes that were 90% damaged and I mean pure dirt with small patches of grass. I counted another 9 holes that were 30-60% damaged. Other area courses for much cheaper are in phenomenal shape. Beyond that, they were very furry (trying to let them grow in I assume) and they were fertilized. Nothing rolled true, hitting chatter and fertilizer along the way. I own a business and I find it appalling that a company would know their product is in that kind of shape and charge full price for their product and not disclose it upfront. If they would have disclosed this information and dropped their rates, I would have still played and been aware. The sad thing is that it is a beautiful course and phenomenal layout. I bet when the greens are in great shape, it's a very fun course. Because of their lack of respect, I will be scheduling our group of 30 players for our upcoming trip for a week at another facility. The Thistle features three courses - Cameron, Mackay, and Stewart - and boasts an authentic Scottish feel to it thanks to designer Tim Cate.